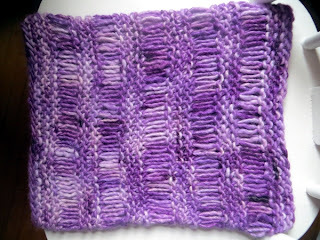 Watching gorgeous movies and knitting the same (easy) pattern over and over in different yarns is a great way to make nice memories out of gift knitting season. The purple cowl in the middle should be familiar - it's the one I knit twice, because the first time I knit it too wide to work as a hood for a friend who wears her hair up a lot such that hats are a challenge. I was very worried about how this one would go over but I loved the finished product, and I guess I was right to do so because she says it works exactly as I hoped, and she loves it. Yay! 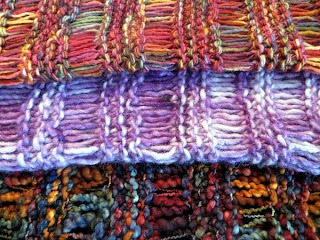 The other two were both made with stand-in yarn because the Noro Odori I'd intended to use came out scratchy and a bit seaweedy-smelling when I made a test cowl with it. 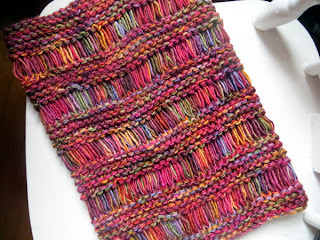 That was so weird - it didn't happen with the Spin Cycle Hat I made with the same yarn in a different colour. I was so close to my deadline though I couldn't worry about the Why. This autumn-coloured cowl is made with very soft wool spun into an extreme thick and thin by Fleece Artist (Tosca). 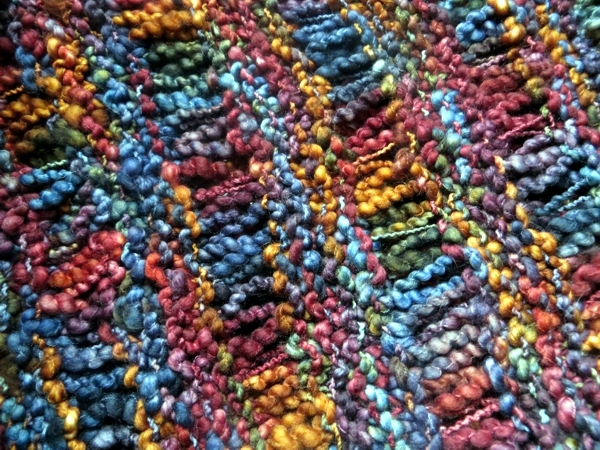 Making the drop stitches was a bit of a challenge with this yarn but I loved all the colour and texture and I think it will be really warm to wear. When it came to Lannie's cowl, the only possible solution was Yarn Held Double, but even that was a stretch - the only soft-enough yarn I had on hand in any weight heavier than sock was a single ball of Manos del Uruguay Silk Blend, a variegated silk/wool sport weight, plus most of a second one in an entirely different colourway. Thankfully there were enough overlaps in the two sets of colour to suggest the idea of combining them. And then I took it all to a very special Christmas concert and knit almost all of it during the program. This was absolutely the most lovely knitting to do, and what a great place to do it - soft lights, gorgeous choral music, heavy snow outside, and a matchy favourite knitting bag to boot. Yum. 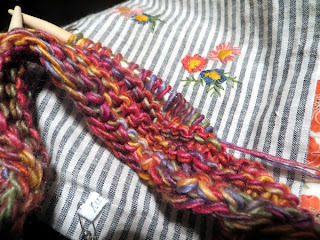 Meanwhile, since all the cowls settled down, I've been spinning. Drop by tomorrow to see!